Artificial flowers and plants today look so authentic that you pretty much have to touch them to be sure what you're looking at is indeed an artificial piece. I remember once, having moved into new office space, the decorator went so far as to pre-decorate some of the office space using artificial plants. Not knowing this, my new assistant actually watered the plant on the first day, only to notice days after that that the plant was actually artificial. It was placed in the pot with real earth and all, and the stem and leaves looked so real. 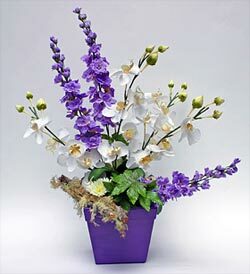 Artificial flowers and plants allow more freedom in decoration. First of all, they don't wither, need virtually no maintenance (well, except some cleaning maybe), and probably most important, they come in all shapes, sizes, and variants no matter what the season is. So if you like tropical flowers, but live in a cold climate, your problem is solved. Artificial flowers are usually and mostly made of silk, as this material really produces the most realistic effect. The Chinese have been using silk flowers as decorations thousands of years ago, but it's generally taken that the Italians have commercialised silk flowers in the 12th century (having just setup trade relations with China). By the 14th century though the French took over as master silk florists, having taken the craft to the highest limit then. Later on, the Victorian Age has brought an expansion in floral arts, both real and artificial. Materials used were satin, velvet, calico, muslin, cambric, crepe, gauze, and later wood, palm leaves, porcelain and metal. Ecologically, artificial flowers and plants are a great product. There are no left-overs or waste materials. Everything used for making them is actually contained within the product. Needless to say, they are hand made works of floral art. At least the ones we make and install into your homes or offices. The technology of making artificial flowers and plants is advancing, giving us new materials and methods of joining parts together to look even more realistic than ever before. Replicating nature is virtually impossible, but new materials and methods allow us to make faux flowers that are stunning. It takes a lot of expertise and skill, and really pushes the artist to their limits. We are always in touch with the latest developments and readily implement them on our products, guaranteeing your home or office space is decorated with the products of highest quality. If you've been thinking about decorating your work or life space, get in touch with us and let us show you how preserved, dried and silk flowers and plants can work for you.